Homecube Wine Bags, 2pcs Cute Santa Claus & Snowman Doll Wine Bottle Cover Party Christmas Table Decoration by Homecube at Verve Wine Bar. MPN: HCJJ012FF. Hurry! Limited time offer. Offer valid only while supplies last. SUITABLE FOR: Christmas decorations supplies, for holding your Christmas gift, candys or wine. Add a festive look to your holiday party with Santa Claus wine bottle Covers. PORTABLE: Convenient to carry and light weight. A quick and easy way to dress up your holiday table! 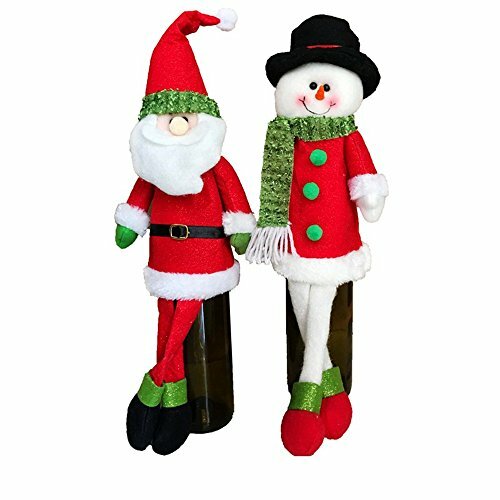 PACKAGE CONTENT: 2pcs Cute Santa Claus & Snowman Wine Bottle Cover.